Having the entire genetic code divided into different chromosomes allows the possibility of variation through the different combinations of chromosomes with the different alleles, or genetic variations that they contain. The recombination and mutation of chromosomes can occur during mitosis, meiosis, or during interphase. The end result is organisms that function and behave in different ways. This variation allows populations to evolve over time, in response to changing environments. The chromosome holds not only the genetic code, but many of the proteins responsible for helping express it. Its complex form and structure dictate how often genes can be translated into proteins, and which genes are translated. This process is known as gene expression and is responsible for creating organisms. Depending on how densely packed the chromosome is at certain point determines how often a gene gets expressed. As seen in the image of chromosome structure shown below, less active genes will be more tightly packed than genes undergoing active transcription. Cellular molecules that regulate genes and transcription often work by activing or deactivating these proteins, which can contract or expand the chromosome. During cell division, all the proteins are activated and the chromatin becomes densely packed into distinct chromosomes. These dense molecules have a better chance of withstanding the pulling forces that occur when chromosomes are separated into new cells. As seen in the graphic above, chromosomes have a very complex structure. DNA, or deoxyribonucleic acid makes the base of the structure, as seen on the far left. DNA is made of a two strings of nucleic acid base pairs. The base pairs in DNA are cytosine, adenine, thymine, and guanine. The spiral structure formed by the two strings of DNA is due to complimentary pairing between every base with its pair on the opposite string. Adenine pairs with thymine and guanine pairs with cytosine. 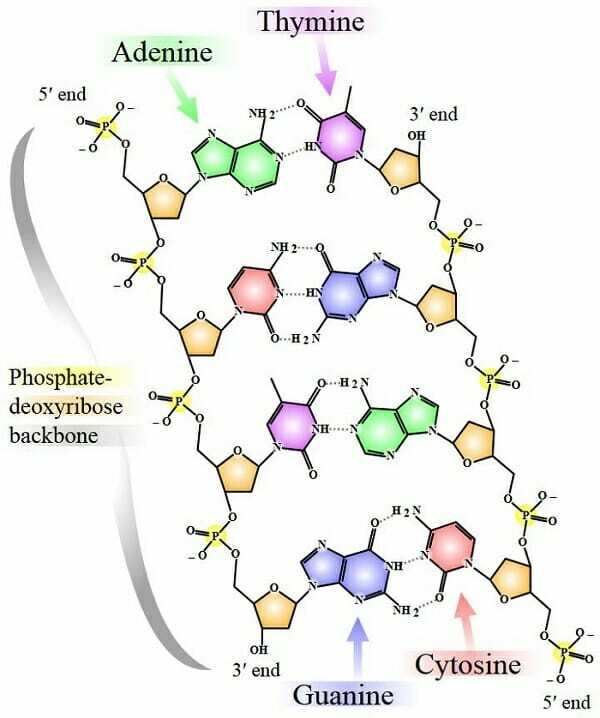 The opposite side of the bases form a phosphate-deoxyribose backbone, which keeps the strands intact. When the DNA is duplicated, the strands are separated, and a polymerase molecule builds a new string that corresponds to each side. In this way, the DNA is perfectly replicated. This can be done artificially by a polymerase chain reaction in which special enzymes and heat are used to separate and replicated the strings a number of times, to produce many copies of the same DNA. This makes it much easier to study any string of DNA, even whole chromosomes or genomes. After the cell has expressed and duplicated the DNA, cell division can occur. This occurs in both prokaryotes and eukaryotes, but only eukaryotes condense their DNA so it can be separated. Prokaryotic DNA is so simple that relatively few structural proteins are associated with the chromosome. In eukaryotes, many structural proteins are used. The first of these proteins are core histones. Many individual histone proteins bind together to form a core histone. The DNA can wrap around one of these histones, giving it a wound structure. This structure, and the associated histone, is known as the nucleosome. As seen in the third picture from the left, these nucleosomes form “beads-on-a-string”. The string becomes wound back and forth by another histone, histone H1, and eventually fibers are produced. The next type of protein, scaffold proteins, start to wind the fiber into a loose structure. When the chromosome must condense during cell division, more scaffold proteins are activated, and the structure becomes much denser. In fact, even with a microscope, individual chromosomes cannot be discerned until near the middle of cell division cycles, when the chromosome becomes very dense. This process is seen as the pictures progress towards the right. Chromatin – DNA and its associated proteins, of which chromosomes are a part. Sister Chromatid – The still connected copies of a chromosome, which will be separated into individual chromosomes during anaphase of mitosis or anaphase II of meiosis. Homologous Chromosomes – Pairs of chromosomes from separate parents that contain the same genetic information, which are separated in anaphase I of meiosis. Sister Chromosome – One of the two new chromosomes created during DNA replication, which are now separated from each other and will soon be in different cells. 1. A species has 6 homologous chromosome pairs in somatic, non-gamete cells. How many chromosomes are present in the gamete cells? How many homologous pairs? C is correct. In a gamete, the homologous pairs have been separated, which allows the newly formed zygote to have the right amount of chromosomes, each of which will have a homologous pair. Therefore, the homologous pairs are separated in meiosis I, and the sister chromosomes are separated in meiosis II, giving each gamete the perfect amount of DNA to create half a zygote. 2. The DNA has been replicated in a cell containing 4 chromosomes. The cell is going through mitosis, and sister chromatids are being separated in anaphase. Before the cell divides, chromosomes will exist in the same cell. How many chromosomes will exist in the cell between anaphase of mitosis and cytokinesis, or cell division? B is correct. Each chromosome, before anaphase consists of two sister chromosomes, bound together by proteins. During anaphase, these proteins are deactivated, and the two chromatids release each other. Once separated, they are known as sister chromosomes. Before the cell divides, it is actually one large cell, containing 8 chromosomes. What is the student doing wrong? A. Cytokinesis should have twice as many chromosomes. B. Before anaphase should have 8 chromosomes. C. Interphase should have 4 chromosomes. C is correct. Although the student cannot see the individual chromosomes during interphase, the chromosomes still exist. They just exist in a much less dense form, which makes them impossible to see, even if they are stained. The student has written 0, because it appears that the chromosomes have disappeared, but in reality there are still 4 chromosomes. At the end of interphase, they will have duplicated, but there will still be only 4 chromosomes. Each chromosome will consist of two sister chromatids.